Klikněte na fotografii a zobrazte všechny dostupné fotografie k Apt 4, Soho Apartments (2nd flr). Apt 4, Soho Apartments (2nd flr) is situated in the Westminster Borough district of London, 600 metres from Carnaby Street and 900 metres from Piccadilly Theatre. The property has city views. The apartment features 1 bedroom, a living room, and a kitchen with a dining area and a dishwasher. A flat-screen TV is provided. Dominion Theatre is a 14-minute walk from the apartment, while Piccadilly Circus is 1.2 km from the property. 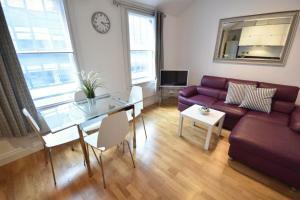 The nearest airport is London City Airport, 16 km from Apt 4, Soho Apartments (2nd flr). Please be advised this property has a self check in process. After the property receives your payment, you will be sent a key code by email. You will need to bring this key code with you to the property to let yourself in. If you do not have your key code, you will not be able to access the property. A damage deposit of GBP 200 is required. The host charges this 28 days before arrival. This will be collected by credit card. You should be reimbursed within 7 days of check-out. Your deposit will be refunded in full via credit card, subject to an inspection of the property.